#DEATH tweet Book02 | THiNKaha: Become a recognized expert in your field of expertise. Compelling thought leadership content. ‘#DEATHtweet Book01’ seeks to disarm and demystify death, to consciously expose its teachings, to guide us toward a life filled with purpose and meaning and, in whatever time remains, to experience ourselves and our world in all its abundance. In 140 bite-sized perspectives, Timothy Tosta — attorney, author, cancer survivor, and seasoned volunteer hospice worker — shares with us the lessons he learned about life when faced with his own death. ‘#DEATHtweet Book01’ inspires us to see our life experience as an incredible gift, to approach every human interaction with awareness and generosity, and to find meaning, balance, and happiness in our lives. Just as each person is unique and lives an extraordinary life, he suffers a solitary death. While none of us welcomes it, we acknowledge its inevitability and try to fathom its importance and meaning . #DEATH tweet Book02 will make the journey easier to endure and the mystery easier to understand. Moving, Touching, Inspiring! The unique perspective of #DEATH tweet Book02 is informed by Tim’s personal journey toward compassion and unconditional love for ourselves, and those we care about during the final moments of life. Unlike other books that read like a manual for coping with death, this is a generative invitation that moves us to take action and create new possibilities in our lives as we celebrate the lives of the people we care for. The Western world fears the naturalness of death and dying. Tim Tosta guides us to remember our humanness by urging us to fearlessly show up in the present moment as the witness for the other. The value of something is only understood in two instances: when it is earned and when it is lost. The value of life, however, can only be measured when one comes close to losing it. No one else can understand with clarity its true weight in gold, and only those who come close to dying have acquired the gift of that perspective. Tim’s personal experience helps us not only understand the value of what we have, but it also gives us every reason to celebrate the optimism of life. Written in a contemporary Tweet fashion, the book’s message is devoid of hyperbole and cuts directly to the core of Tim’s message of valuing life by understanding its final chapter – death. Tim has chosen to explore death as part of life and in the process has made this difficult, unsettling subject more approachable for us all. #DEATH tweet Book02 is a gem. Thank you @TTosta for offering clarity and love and illuminating the path of compassion. Easy to digest wisdom for people of any health and any age. If the Buddha tweeted, he might have written this! 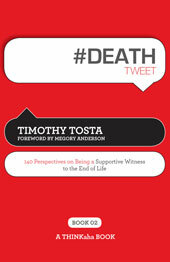 Timothy Tosta, author of ‘#DEATH tweet Book02’, is an innovative, insightful and evocative speaker and writer. He is a cancer survivor, a seasoned hospice volunteer and an executive coach. He also is one of California’s leading land use and environmental attorneys. Following on the resounding success of Tim’s earlier book, #DEATHtweet Book 01: A Well Lived Life through 140 Perspectives on Death and its Teachings, in which he disarms and demystifies death to expose its teachings on living a life filled with meaning and happiness, this volume offers direction to caregivers, family and friends in supporting a parent, sibling, spouse, child or friend at the end of life. How do you forge the helping bond, manifesting your empathy, compassion and kindness? How do you face your own fears and uncertainties in this daunting task? How do you address another’s pain and suffering? In bite-sized perspectives, the book describes two journeys – the heroic journey of the witness and the freeing journey of the other at the end of life. It offers perspectives on death and distinguishes pain and suffering. It addresses preparation for the role of witnessand the work itself. Finally, it speaks to the difficult matters of compassion fatigue, active dying and grief. Tim’s personal experiences as a cancer survivor, hospice volunteer and being with his own parents at the end of their lives combine with his coach’s humanism and lawyer’s insight to create unique, rich and welcoming perspectives to the end of life experience. As life must come to an end, it should do so with the caring, compassion and love proposed by these 140 offerings. #7 To overcome fear, you must develop spacious awareness in which your empathy, compassion, generosity, and love grow. #18 Death teaches you to surrender what you cannot control and fl ourish in the abundance of what remains. #66 True listening is an act of empathy. You share the Other’s experience without getting caught in the Other’s narrative. #100 When you feel tired, seek rest. It allows you to become aware of your body, your emotions, and your surroundings. #127 In grief, there always are regrets. Regrets belong to the past. Let them go. If necessary, forgive yourself. #DEATH tweet Book02 is part of the THiNKaha series whose 100-page books contain 140 considered insights (tweets/ahas!). Book recommendation from the National Law Journal. Without considering death, life is confusing and superficial. #DEATH tweet Book02 delivers a compassionate message, offering critical support, wisdom and a genuinely helpful perspective. Every once in a while there is a book published that fills an extraordinary void. Tim Tosta has written this kind of book. His writings offer a way for the dying individual to remain in the present while embracing death in a way which is both humbling and inspiring. Furthermore, Tim encourages the Witness to create their own roadmap for the privilege of accompanying their loved one into such a passage. As a psychologist, I would heartily recommend this sensitively written, compassionate and thought-inspiring book to both patients and professionals as well as anyone interested in facing death with integrity, comfort and an affirmation for life. To use the author’s words, “The only thing that lasts forever is love”. Simply, those words offer profound encouragement to those experiencing the loss of a loved one and similarly it gives the dying individual assurance that their essence will be both remembered and cherished. For anyone dealing with confronting or embracing the realities of death and dying, once again Tim Tosta finds that sacred space where most of us struggle with our emotions, our words and our spirit. #DEATH tweet Book02 allows us to stand amidst these difficult times not driven by fear and anxiety, but wholeness and care. Everyone will face death in life and for those who appreciate the wisdom that can be found in 140 characters, this book is a must. Many of us in the medical arena have spent decades reading monographs and journal articles on death and dying—with the goal of assisting us with our professional responsibilities. Most texts add useful input of the role of us dealing with, and caring for, those near death; the witness. #DEATH tweet Book02, lucidly, through Tosta’s innovative approach to the “Other”, gives more insight into the perspective of the individual dying than have encountered in massive medical tomes attempting, but failing, to accomplish what Tim does here so crisply. This beautiful book contains sutra-like wisdom rarely found in one small volume. Simply stated, it captures the essence of what it means to be alive, to be dying, and to witness both. Having survived a death sentence myself, each tweet touched the depths of my being, and they will touch you deeply as well. We read from #DEATH tweet Book02 aloud at a recent gathering of friends. All of us in and around that mid-life age are coping with dying family and friends…some younger than others. Nothing can eradicate the pain. Sharing the perspectives from #DEATH tweet Book02 was, however, a cathartic experience that moved us all. I watch my friend carry his son’s casket today and place it in the ground. Then I came home and read #DEATH tweet Book02. It was incredibly powerful. Thank you so much for sharing it and helping me understand that supporting my friend is less about fixing what is happening to him and more about creating and holding space for his grief. #DEATH tweet Book02 is a meditation on what it is to open your heart wide and to give purely for the sake of giving – it is also about the inevitable abundance of love you receive in return. If I had #DEATH tweet Book02 when my mom was dying, I would have given copies to my siblings. With it we could have talked more deeply with each other and supported her more lovingly. Tim has a gift for taking deep concepts and expressing them in bite-sized phrases to be savored. Each tweet provides guidance on the wisdom of life’s closure. #DEATH tweet Book02 is a thought-provoking assemblage of wisdom about loving well and letting go gently. I love this book. It is simple, beautifully organized and Zen-like. Tim captures the flow between death and life. He does it in a way that is unique, yet has universal relevance. Though written for caregivers, #DEATH tweet Book02 is a book for all of us. Tim Tosta has committed himself to mindful, generous care for people facing the end of their lives. He has distilled his long experience into pithy and compassionate aphorisms that can help all of us as we confront our own death and the death of loved ones. His book is a gift. Tim’s lucid and compassionate aphorisms suggest that a life spent seeking the unknowable can lead to a feeling of confidence at the time of death. Timothy Tosta, a partner at Luce Forward in San Francisco, is recognized as one of California’s leading land use and environmental attorneys. He is a cancer survivor, a seasoned hospice volunteer, an evocative lecturer and writer, and a certified Integral Coach who guides executives in the legal profession and the business community to live purposeful, balanced, thriving lives. He is the author of the highly acclaimed lecture series, Lessons for the Living and the emotionally evocative hospice writings, Putting Things in Perspective – Stories from a Hospice Volunteer. Tosta has a JD from UC Berkeley School of Law and a BA from Princeton University. His Twitter handle is @TTosta.